Teething!! Oh how different it has been the second time around. With my first you would mention teething and I would ask “What is that?” We was lucky with our daughter, teething was never an issue, all her teeth came through with no problem at all. We used a bit of Bonjela Teething gel and lots of things to pop in her mouth and before we knew it all her teeth were through and that was it! However, this time around has been a very different story. My son started teething at around 10 weeks old, constantly biting on everything he can get his hands on. He started refusing a dummy (which isn’t a bad thing I suppose) and some days he moans with frustration that they are sore. When you have a baby you will know the frustration of not instantly knowing what causes your baby to be in discomfort, from a wet or soiled nappy to being too hot or gassy you will go through and eliminate everything and then you get to teething! We got things under control pretty quickly and as you can see I have invested in some great products that are helping us along this very uncomfortable teething stage. 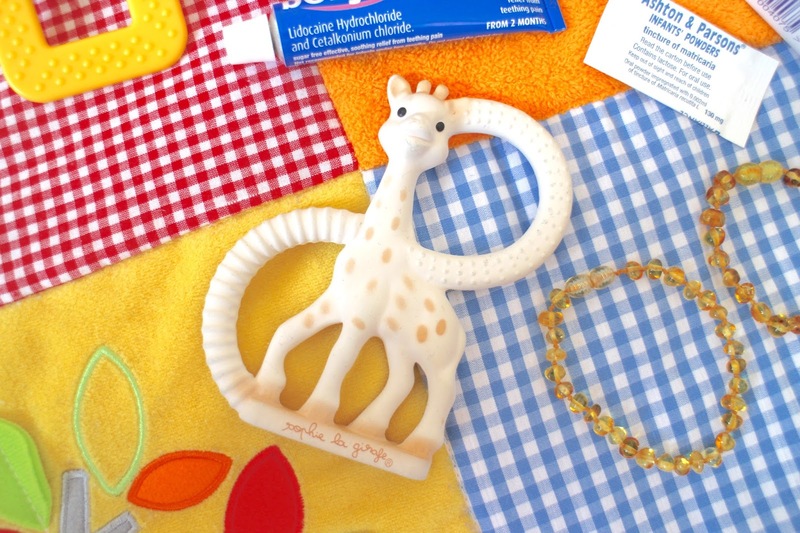 Yes, some days are better than others but we have our teething essentials now to help get through those bad days. Every baby is different and your maternal/paternal instincts will kick in and in next to know time you will know what works for your little one. 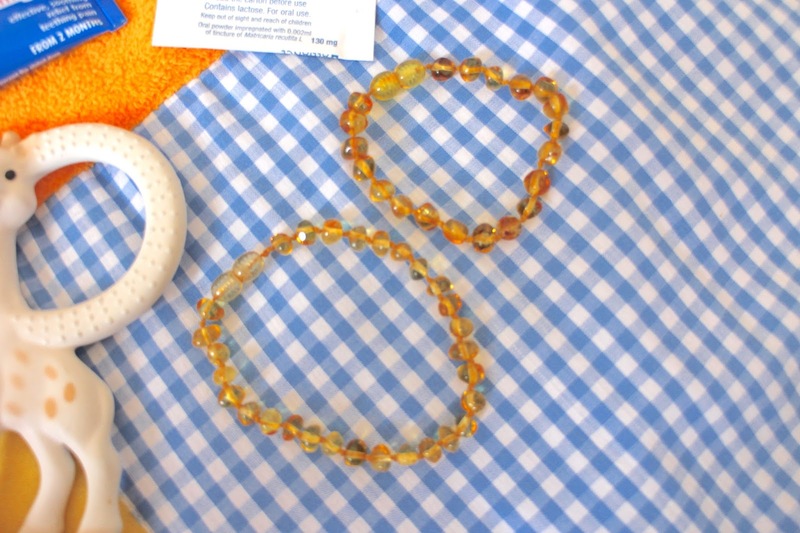 AMBER BRACELET // We used these amber bracelets with my daughter and even though they have mixed reviews, I like to think they work, we wear them as an anklet. Baltic Amber is known to help relieve eczema, heal wounds, prevent ear and throat inflammations and help soothe and calm teething pains for both babies and adults. We bought these from a website a friend from work recommended, Amber Pumpkin. We are currently looking to buy some more and you can pick what colours you want and in what type of jewellery. SOPHIE LA GIRAFE // This was bought as a gift for my son from a dear friend of mine and I can not rate this product high enough, what a fabulous idea! He loves this toy, from a young age he has been able to hold and munch on this product and it instantly helps him feel calm. Made from 100% non- toxic natural rubber, it helps to stimulate senses and soothe teething pains..brilliant! You can find this product and a large variety of different sizes and types on their UK website, Sophie La Girafe and at many well known baby stores. There is so many varieties and we will soon be investing in some other bits! PONY PETE TOY FROM ELC // This is one of the first things I bought when we found out we was expecting baby number two. Im not 100% sure what the actual name of this toy is and I was not able to find this toy online but I still believe they may be available in store as I still see them in my local store. This toy is a sensory toy, teether and has a vibrate pull action all in one and is by far my son’s favourite toy which comes everywhere with us (gets cleaned so much through out the day!!) Not only does he like to use the teether but he munches on the different texture to soothe his discomfort. If you can find this product definitely try it, its brilliant to attach on to carseats, prams anything to go out and about. 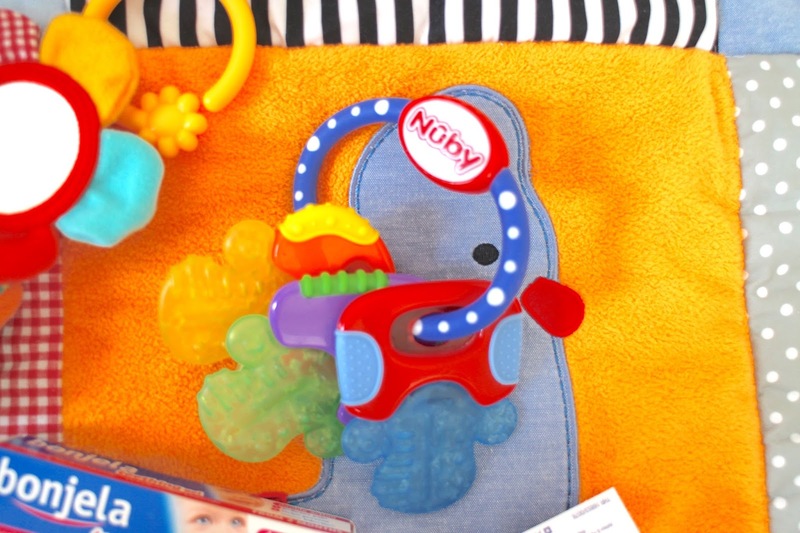 NUBY ICYBITE TEETHING KEYS // We keep these bad boys in the fridge overnight, we also used these with my daughter as it is great for hand and eye co-ordination. This Nuby teething toy is brilliant its is BPA free and stays cool for ages giving baby some play time and chill out time by themselves, soothing and calming. The cold will help have a numbing effect on those ouchy gums and is soft and gently, perfect for those uncomfortable teething days. ASHTON & PARSONS INFANT POWDERS // A ‘traditional herbal medicinal product’, these powders can be used from 3 months onwards starting with half a sachet on a dry tongue in the morning and half in the evening until 6 months where they can have a full sachet and if needed can be repeated every 1, 2 or 3 hours with maxim dose being 6 times in a 24 hour period. 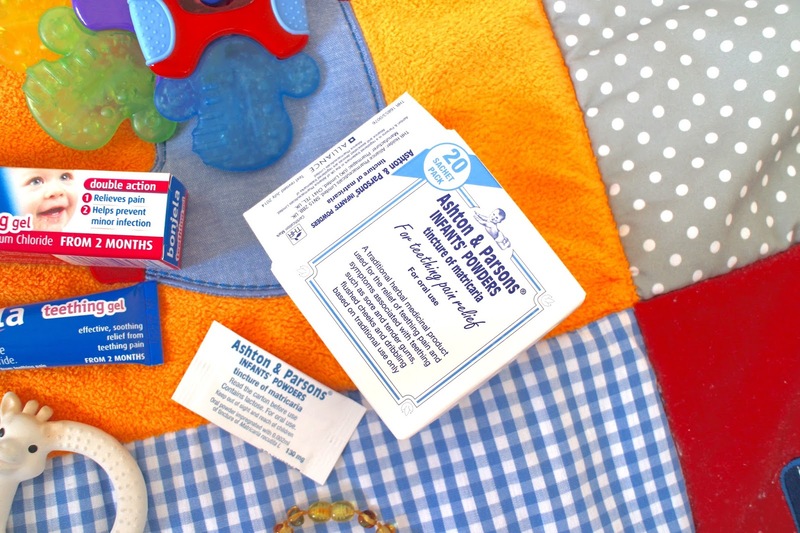 I found that these Ashton and Parsons powders were great those early weeks of teething were it was just teething but recently as the teeth are now starting to cut through i don’t think it has been enough to ease the discomfort and pain. Every baby is different it is a case of trial and error. BONJELA TEETHING GEL // This is another product i used with my daughter and although it isn’t a ‘natural’ product to be used on our babies, it is f-ing BRILLIANT! 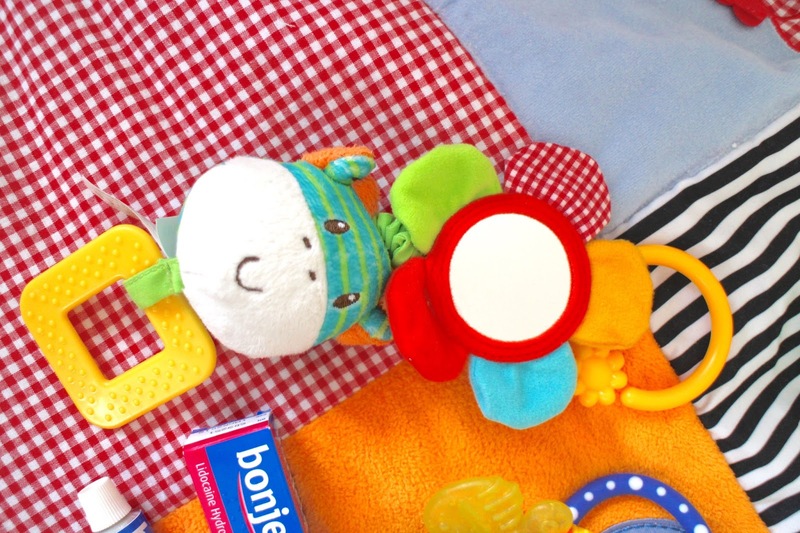 Bonjela works instantly for us, if all our other essential teething products don’t work we gently rub a small amount along both top and bottom gums and boom instant relief. This product is suitable from 2 months onwards and we have one in our baby bag, one in our changing box in the front room and one in his bedroom. The reason this product works so well is the anaesthetic action that targets the soreness of the gums quickly relieving pain. Make sure you have clean hands when applying and remember to be gently when massaging this on their gums as they will be extra sensitive on those bad days, you can repeat this every 3 hours if necessary. For those really bad days we have given the minimum dosage of infant Calpol to help with the pain, but make sure to read the label and only if your baby is over 2 months old. I hope this can help anyone that is looking for a bit of guidance with their teething bubba, but don’t forget you know your baby, if you think nothing is helping and you have done all you can then don’t hesitate to ask your HV or your GP for advice about teething.